BROOKLYN BRIDGE PARK – The NYC Landmarks Preservation Commission (LPC) rejected Starling Architecture‘s design for a new restaurant pavilion that will be built adjacent to the 1926 Marine Fire Boat Station at Brooklyn Bridge Park. Last December Brooklyn Bridge Park Corporation announced that Ample Hills will take over the historic fire boat structure which had been occupied by Brooklyn Ice Cream Factory since 2001. 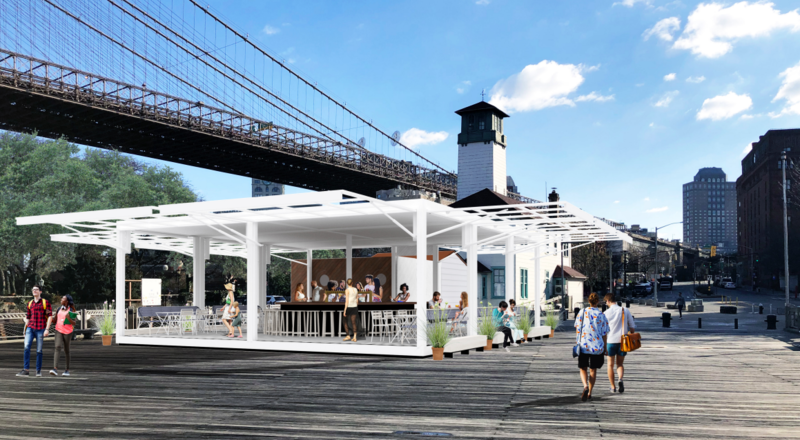 Separately, the owners of Pilot at Brooklyn Bridge Park’s Pier 6, brothers Alex and Miles Pincus, will operate a new open-air cafe/bar that will be constructed beside the fire boat station. Their venue will also include a restored vintage fireboat docked at the pier for additional seating. The proposed one-story venue would connect to a fire hose shed, according to New York YIMBY. The 1929 shed would be refurbished with new rooftop shingles and repainted in its original colors. Plans for the shed include a dining area, bar, full kitchen, and restrooms. The project requires LPC’s approval since the fire boat station and shed are located in the Fulton Ferry Historic District. On Tuesday, April 9, LPC held off on a vote and “encouraged” Starling Architecture to return with “a minimalist design,” as reported by the Brooklyn Daily Eagle. A representative told the paper that the firm will revise its plans. The Historic Districts Council also opposes the placement of the new facility, stating that it will obstruct views of the Brooklyn Bridge and adds that the hose shed is an important historic part of the pier, according to the Daily Eagle. Brooklyn Bridge Park Corporation issued a Request For Proposals (RFP) last summer and awarded Ample Hills and the Pincus Brothers the new Fulton Ferry Landing concession spots. 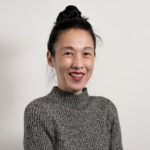 Both vendors were granted ten-year leases with three-year renewal options, according to 6sqft. Both new venues are slated to open this summer. See Starling Architecture’s Fulton Ferry Landing Concession presentation to NYC Landmarks Preservation Commission here.